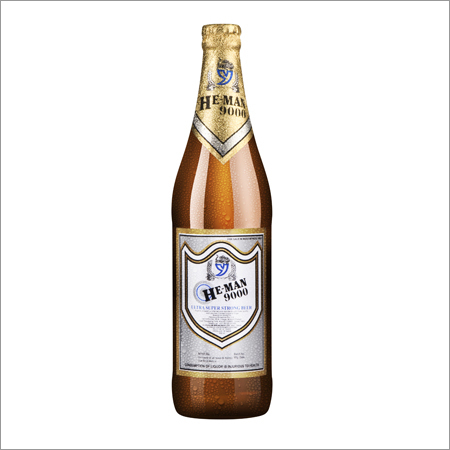 The beer market in India is unique in that it is dominated by high alcohol beers. Humorously named beers such as Hayward's 5000 or He-Man 10000 with numbers indicating the potency held within. The labels vary from the tame "Strong Beer" to "Ultra Super Strong Beer." These extra strength beers occupy as much as 75% of the Indian Beer Market. With such popularity it is no surprise that beer giants such as Heineken, Tuborg and Carlsberg are all making strong beer entries into the up-and-coming beer drinker country. With all the Hype one has to wonder, "How do these beers taste?" Strong beers in India range from 6-8% alcohol-by-volume and for the most part the brewers haven't done a great job of concealing the additional alcohol. It is difficult to generalize the taste of these beers but they range from poor to absolute piss. It seems that the intended use of most strong beers is just for getting drunk on the cheap and not for savoring the flavors. Today, Kingfisher Strong is India’s largest selling beer brand but weather you choose Kingfisher Strong, He-man, Godfather or Knockout you'll be sure to get smashed. Book your flights to India and sample the extra ultra super duper strong beer selection now!